Is Ecosystem Strategy the next growth engine to boost manufacturing businesses? Decision makers are challenged to move their manufacturing enterprises to the next level — to that of digital business transformation — implementing digital solutions, new business models, and innovation initiatives. Ecosystems model of business provides a key growth opportunity as the next growth engine to boost manufacturing business. Today, platform companies represent $2.6 trillion in market capitalization worldwide. Within a few years, core component of corporate valuations will be based on platform ecosystems. 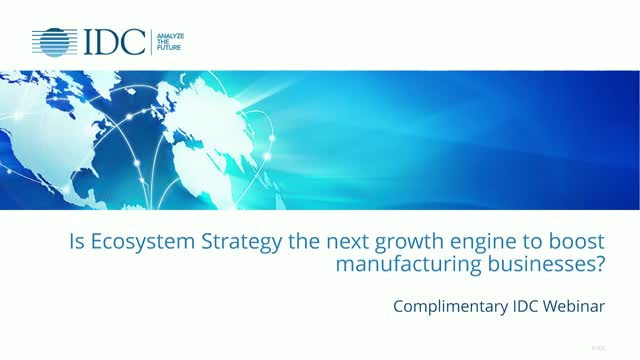 IDC Manufacturing Insights’ research program: IDC Manufacturing Insights: Worldwide Manufacturing Business Ecosystems Strategies, deep dives into the Ecosystem Strategies and finds out the implications for both end users and their IT partners. Product innovation is digitally transforming, to include supply chain, manufacturing, service, and customer information – it is no longer confined to product management, engineering, and R&D. In this webinar, we’ll discuss this advanced, digital innovation platform approach to product design, development, and collaboration, and how 3rd platform technology and innovation accelerators, as well as digital twins, can empower your organization. Mass customization and innovative service experience will drive tomorrow's profit and revenue. Strongly customer-focused manufacturers with service-oriented offerings will enjoy a premium against the competition. It will all be about context, collaboration, and servitization; these can be achieved either by delivering data-driven value-added services or by adding products or services from other companies to an existing product. The good news is that many manufacturing companies across segments are looking for next-generation automation and collaboration models that will support supply chain transformation, production, and customer experience innovation. Direct-to-consumer and B2B businesses will leverage technology enablers such as automation, blockchain, and AI-driven capabilities to achieve business performance objectives and differentiate. "Collaborating in ecosystems — and automating their efficiencies — will therefore become a key capability for manufacturers, and products will become platforms in new business ecosystems," said Nilmadhab Mandal, research director, IDC Manufacturing Insights. "Manufacturers will have to establish appropriate business ecosystem strategies sooner or later to achieve success, if not for long-term survival." Today, the very core of a manufacturing business — the production process — is being completely revolutionized because of the convergence of physical and virtual technologies. These key transformations happening within the factory floor are often referred to as Industry 4.0, digital factory, or simply smart manufacturing. This webinar introduces the NEW IDC MaturityScape on smart manufacturing and discusses the framework to identify the stages, critical measures, outcomes, and actions required for organizations to evaluate and evolve their digital factory strategies. Organizations can use the insights to identify where they stand in relation to modern digital capabilities and create a path towards achieving world-class manufacturing processes. In this IDC presentation, IDC’s Aly Pinder, Program Director Service Innovation and Connected Products discusses the impact that service parts management has on the ability for manufacturers to resolve customer issues in the field. As manufacturers transform from primarily selling equipment or products to selling value-add experiences to customers, service parts will play an increasing role in delivering on this new promise of value. Learn more about innovation transformation through digital twins. In this presentation Reid Paquin, Research Director for IDC's Manufacturing IT Priorities & Strategies (ITP&S) program, discusses recent findings from IDC's CloudView 2018 benchmark survey. He will cover the shifting Cloud strategy among Manufacturers, Cloud's impact on meeting business objectives, and what prevents companies from meeting these goals. In addition, top selection criteria, major concerns, and the use of Industry Cloud (IC) will be discussed. Senior IT leaders and line-of-business executives will come away with a snapshot of the Manufacturing Cloud landscape and guidance on incorporating Cloud into the IT portfolio to drive innovation and Digital Transformation. IDC’s Aly Pinder, Program Director Service Innovation and Connected Products discusses two predictions for 2018 specifically impacting service innovation for the manufacturer over the coming one to three years. These predictions and trends highlight how manufacturers are re-thinking the way in which service can be delivered and how value should be created for the end customer in a changing digital world. Title: Is Ecosystem Strategy the next growth engine to boost manufacturing businesses?